The Supra was the first car to go. It was a 1984 Toyota Celica Supra, white with maroon interior, velvet seats, silver radio like an Aiwa boombox. Rough on the edges, a 1980s street survivor. We gathered for the start of the Touge California vintage rally, here on the outskirts of Thousand Oaks, and its owner Joe lived down the street. (This detail will be very important very soon.) The Supra never skipped a beat, he assured me. Its chunky radio, its cracked box flares, its sheer wedginess—I loved it. Needed one of my own. “You want to ride in it?” he asked. 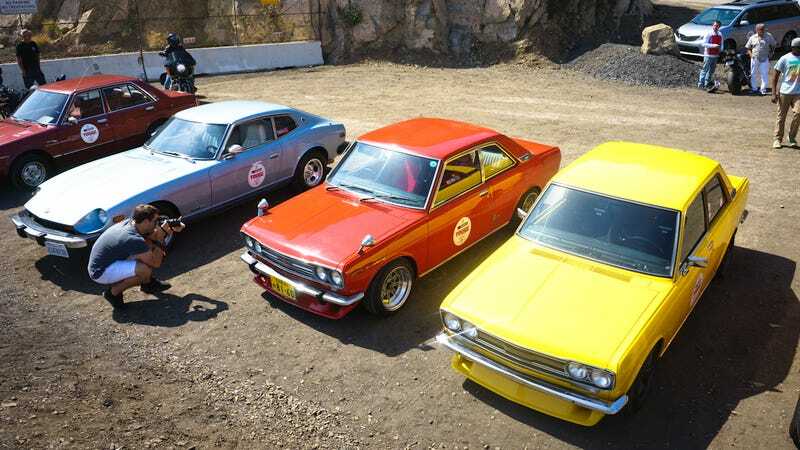 This was the first-ever running of the Touge California, an event that sprung forth from the mind of one Ben Hsu, the founder of online broadside Japanese Nostalgic Car, and—in a bid to put his money where his mouth was—the wrangler of a daily-driven Toyota Cressida wagon, among six or seven other modest machines. He had looked upon the likes of the great grand-touring rallies of the past, the Mille Miglia and the Targa Florio, and their modern counterparts in the guise of the California Mille and the Petrolicious Rally. With the operative word here being Japanese: Tōge (峠), or “mountain pass,” he decided that it was time for chrome-bumpered Toyotas to shine. Above, top to bottom: stopping at Mugu Rock; a bunch of chrome-bumpered Celicas; a pair of coincidental Japanese tourists are very amused at gaijin shenanigans. Yes, 1.) classic Japanese cars are a thing; 2.) being not always shameless copies of Anglo Saxon products, they’re not a “poor man’s” anything, the way certain idiots describe a 2000GT as “a poor man’s Jaguar E-Type”; and 3.) they had always existed before the Pebble Beach set thinks they discovered them, like Columbus laying claim to a New World that had always existed. Here, then, was the feeling, the emotion, of spirited driving across 120 miles of switchbacks, coastal paths, steep elevation changes, and no shortage of winding mountain passes—the touge—in all manners of Nippon equipment, stock and wild, tall and tiny, of varying levels of bosozoku, and occasionally obscure enough to give Jason Torchinsky the meat sweats. We left Thousand Oaks late, sometime after 12, heading down the 101 Freeway. The sky was overcast, but would burn off when we reached the coast. I rode shotgun, and Joe drove, and his son graciously squeezed his six-foot frame into the backseat. We had only passed two exits when the cabin began to fill with the acrid smell of clutch. Joe seemed somewhat unperturbed by this, and by extension, I did too. His son sat bolt upright in the backseat. Then, white smoke billowed out from the corners of the hood, and that’s when we really knew we were in trouble. We pulled into Joe’s driveway. He lives on a ranch in a quiet subdivision and, when he first moved in, ripped out the horse stables to park his modest and fascinating car collection: trading horses for horsepower, he’s fond of saying. Underneath a vast carport he built himself are a pair of Fiat 850 Spiders, a Toyota Celica ST, a Datsun 510, a Volvo 1800ES, an Alfa Romeo GTV, a Jaguar E-Type Series III that’s his foremost pride and joy, a never-seen-dirt Baja Bug, a Pontiac Fiero painted in Gulf colors, a Chevy truck that’s a near-copy of the one from The Fall Guy, a Saab Sonnett III from a moving sale that he lowballed just as the seller was climbing into his moving truck, and a Ford Capri that he got from a Mini dealer for free because they didn’t know how to get it running. Joe tightened up a transmission linkage and drove it home. But the rally was looming, and we had to get moving quick, so Joe parked the Supra on his sloping driveway—”won’t be a problem,” he assured, “I’ll probably go through it tonight”—and we piled into a 2012 Hyundai Veloster Turbo, and stuck the roundel on the door, and became the only entrants to finish in a Korean car that, as it turned out, also wasn’t very nostalgic at all. You had to either be a successful businessman, a government official, a mob enforcer, or as is often the case, all three. “I know someone in the 1970s who attempted to buy a Century and he was refused.” Because he was an American, see—and the dealership feared that he would bring to the US. Perhaps Americans couldn’t wrap their minds around a luxobarge Toyota. Certainly the salesmen didn’t want to find out. Kirk is neither of these things, as far as we know, and all of his fingers are intact, but nonetheless he acquired this Century late last century, in 1988. He owns two: his other one is a 1968. No, this 1973 model has a V8, a modest 3.4 liters at that, complete with all-aluminum construction and hemispherical chambers—the “Toyota Hemi.” (Let’s go stuff one in a Dodge Dart!) It produces 180 horsepower, but more notably, 275 lb-ft of torque. Plenty for passing. And, perhaps most importantly, it is as calm and serene as housesitting for your grandmother. Note acrylic bosozoku shifter, which nobody ever knows what it’s really called. The spherical rear light is reminiscent of an early Boeing product. Paisley-upholstered cloth is the color of leftover oatmeal but feels gentle and comforting, bristling gently under fingertips. I looked and looked, but where was the flip-down cushion that allows Mr. Big to stick his feet through the front seat? All but missing. In 1980s Japan, which surely was filled with ceaseless wonder, Kirk grew up seeing modified Centurys whose owners looked to Mercedes AMGs with longing. When the Century fell out of the hands of the executives, it fell into a minor form of youth protest, the bourgeois made bosozoku. And so, his Century features the bosozoku touches of his youth: period-correct SSR Reverse Mesh wheels, “more Japanese” than your standard BBS. Lowered two inches. Bubble shifter, tsurikawa. And working factory air conditioning, which went unused, so I opened all the windows. And so. If you’re sufficiently impressed as I was, you can conceivably log onto Goo-Net Exchange, cancel all your subsequent appointments, and after 6-10 bottles of Rolling Rock make the fortified and impromptu decision to roll like Takahara Kazuhiro in Japan’s finest luxury car. And it’ll cost you anywhere from $4,540 to over $50,000—or, on average, the price of the Lexus LS460hL’s Executive-Class Seating Package. Who needs massaging seats, anyway? Who needs leather seats, for that matter? Of course, you won’t be able to bring one of the newer and cheaper ones to America thanks to The Man, who would probably ride in one if he were in Japan, ironically enough. But surely the Canadians are hurrying. “Only in the last ten years, there’s been an appreciation for these,” said Kirk. Judging by his burgeoning popularity on our Saturday morning drive, that much is clear. Hurry. Operators are standing by. “What amazes me about this car is what I haven’t had to replace,” said Chris Hoffman, who bought this Honda CRX brand new in 1987, when your humble author was a mere zero years old. It was his first new car. Two years later he migrated from Somerville, Massachusetts, to Los Angeles, and the car went. And a mere one hundred thousand miles later—a mere 4,000 per year—the car stands pristine, and Chris stands a relentless defender of the Compact Renaissance. “Ah, heh heh, let me get that,” he winced as I unwittingly opened the hatch to store my jacket. Sorry, Chris. I forgot that this isn’t a brand new car. Original transmission. A new clutch came at 50,000 miles. Original dealer-installed R12 air conditioning, blows ice cold. Original radiator hoses, “which is scary,” he admitted. Tokico shocks and Koni springs represent the only modification. Recently he found that an o-ring in the plumbing was installed backwards at the factory, causing a slow leak. When he removed it, the CRX spit fuel across the engine bay. “Whoops,” he noted, “gotta shut that off.” But the point still stood. When he put it back the right way, he marveled at how an o-ring lasted this long backwards. Chris and his CRX were the subject of a recent Petrolicious video, aptly titled “Original Fanboy.” The peanut gallery protested—there was no way this car didn’t receive a 100-point, concours-worthy, budget-defying restoration. No way. Inconceivable. “We’ve been up to 14,000 feet!” he defended himself. “We’ve been to Mojave before, etc. It was my daily driver for years. It’s a real car!” Chris has kept it garaged nearly every year he had it, where it shares space with an 18,000-mile 1980 Accord, a 1972 Dodge Charger that was featured in an episode of Mission: Impossible, and a 1983 Civic wagon now serves as his daily. But the CRX stands by, ever-faithful. Years ago, I wrote a story reflecting the CRX as mediocrity, how I hadn’t been blown away by its 1980s-esque charms. Not underwhelmed, merely whelmed. Sitting with Chris, I expected to stand trial answering for war crimes. But he never yelled, and he never gnashed his teeth, and by the end I got it, Capital G Got It. Both the CRX and the general air of passion throughout. I had always gotten it, I suppose. But there’s something moving about holding onto your first new car and maintaining it ever faithfully, watching other examples get rodded and rotted until they’re dime-a-dozen Craigslist junk—until its rarity becomes evident in its stock simplicity. Pristine and beautiful, forever. Call it Preservation Of The Norm. It’s a movement I can get behind. And Chris Hoffman is its savior. As we neared our final checkpoint, it became evident that perhaps John should have. Through the high, damp mountain passes, the carburetors coughed and sputtered. By the time evening fell, it began to bog in third gear. We pulled over for gas. John apologized. No worries, I said. Yeah, he guessed, it should hold. “Few years ago,” he said, “Nissan contacted my club to see if I was stupid enough to drive out to Glendora to do a photo shoot with my car. 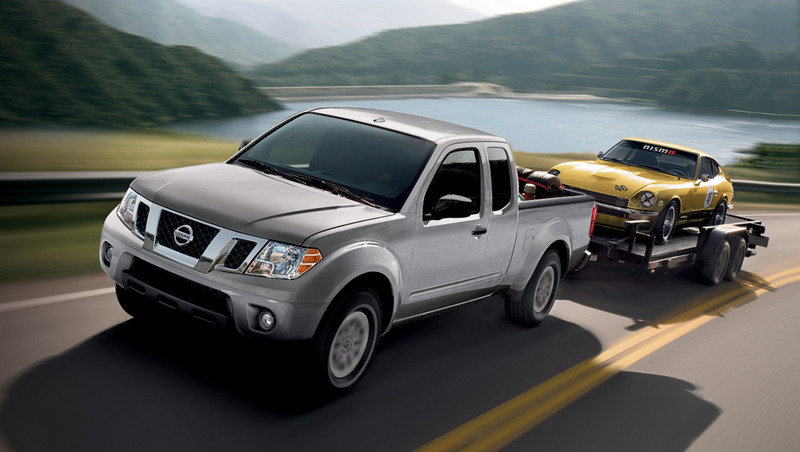 So I went up there and they hooked my car up to a trailer, on a Nissan Frontier, and they did a whole professional shoot! They fed me all day, they had a motorhome, there was a guy in there cooking restaurant-quality food—I’m talking filet mignon, shrimp, all day! And in the afternoon he comes out with a case full of Klondike bars! So it’s the end of the day, I’m about to go home and they say, wait, wait, wait, and the guy goes into the motorhome and gives me a check for $600! Just like any other nerd savant out there, you and I included, collector Myron Vernis stays up way his bedtime flitting through endless Goo-Net Exchange tabs, hunting down obscure errata. Only difference is, he actually goes and buys the damned things. “Don’t you wish he would just adopt you?” said Carstories’ AJ Gordon. And so, the genial, soft-spoken Vernis bought this 1970 Mazda Luce Rotary Coupe sight unseen from Toronto-based Right Drive to ship it to his native central Ohio. But first: a shakedown run, here in Los Angeles. The Luce is the only front-wheel drive rotary-engined car Mazda ever produced. Movie-theater upholstery and an IMAX view. All you need is the spilled Cokes. Unsurprisingly, it doesn’t run well. Its 13A triangle-spinner generates more noise than power. It started the rally choking on unkempt carburetors; it finished the rally in noisy, sputtering, fingernail-clenching tension. “How long are we gonna be on here for?” said Right Drive’s Michael Kent, as the Imperial Highway turned into the 105 Freeway. “Only nine miles,” I said. The Bertone design, already beguiling on the sedan, is achingly beautiful in coupe form. (Its stylist was a young Giorgetto Giugiaro.) Its seats are upholstered in red velvet, the size and shape of movie theater seats, which is fitting, because one rides shotgun looking over an expansive windshield, across the center lane, tall and bolt upright. The ride is wallowy, cloudlike, nearly reminiscent of the Century’s. Nobody knows what it is, but they guess at it all day long. For U.S.-market passengers, the view from the left-hand seat will never not be amusing. And it finished—clattering into the parking lot of the Toyota Automotive Museum in Torrance, where the rallyists feasted on King’s Hawaiian and received their “I survived the Touge California” stickers, before touring the treasures inside. That night, Vernis and Mike from Right Drive limped the Luce carefully to the Petersen, up the 405 Freeway. Above, top to bottom: Compact? Certainly; cheater routes allowed hooptie cars to skip the more gnarly mountain passes (none did); a brief Dockweiler stopover before the end. Ben Hsu lays down the law. Mazda PR executive Jacob Brown snuck past the age limitation with a technical classic: a 1990 Mazda Miata, from Irvine’s secret vault, with just 40,000 miles on it. I hadn’t seen Jacob in years. We had worked together in a previous life, and it was good to be reunited: two former auto journalists, two sides of the same coin, driving around in yet another white Miata that proves my fate is sealed. He gave Jacob a sticker anyway. Blake Z. Rong is a curatorial assistant at the Petersen Automotive Museum and former Associate West Coast Editor of Autoweek. He owns probably the most unreliable Miata on the entire planet.